Unlike some competing platforms, Symbian handsets have always enjoyed a proper file manager. The File manager on board the C6-01 is a capable app that can basically do anything you can think of with your files - moving, copying renaming, sorting or sending - you name it. You can also password-protect your memory card if you see fit. You can also search for a specific file or directory. All you need to remember is a part of the desired name and where it was located (phone memory or memory card), the Nokia C6-01 will find it in no time. With USB on-the-go enabled on the Nokia C6-01, you can also use the file manager to access USB flash drives and even other phones connected over the optional USB cable. Nokia C6-01 recognized all of the USB flash drives we tried but two. As we already find out non-Nokia handsets are not supported by the USB on-the-go service. But when you plug the other end of the USB cable in a Nokia phone, its memory card immediately pops up inside the C6-01 file manager. Symbian^3 might have vastly improved the UI but the gallery was definitely not on the upgrade list. The Nokia C6-01 comes with virtually the same image browsing software as its predecessors and, honestly, it’s barely passable by modern standards. Sure, sweep gestures have been available for a while now and you are also getting pinch-zooming so it’s not all bad but some eye-candy would have been more than welcome. Once you’ve zoomed on an image however, there’s no kinetic scrolling and panning and that’s sure to cost the C6-01 a few points. On the positive side, opting between portrait and landscape mode is automatic, thanks to the built-in accelerometer. In addition to the familiar pinch gesture you can also zoom in by double taping, the volume rocker or even the on-screen slider. Selection of multiple photos for deleting or sharing is available straight in the gallery. Unfortunately, sharing is only available via MMS, email or Bluetooth with no image sharing service integration. We guess that can be easily fixed by installing the necessary uploading profiles for the services you’re interested in. At least that’s how it works on non-touch Symbian smartphones. The other features of the image gallery include the image tagging system for easier image sorting, the slide show and the albums system (again helping you sort your image database). Overall, picture browsing is relatively fast even with 8MP pics, but zooming is somewhat slow. You need to wait for a second or two every time you start zooming in on a photo. Symbian never had trouble with the music player features but its looks were far from impressive. With Symbian^3 however Nokia introduces a new Cover Flow-like interface, which adds the much needed eye-candy. There’s automatic sorting by artist, album, genre and the option to create custom playlists straight on the phone. With the huge number of supported formats, equalizer presets and effects the feature set is complete. Quite naturally, the player can also be minimized to play in background. In this case you can control it through the music player widget on the homescreen, which also displays the currently running track. In terms of audio quality the Nokia C6-01 behaves just as good as the other two Symbian^3 handsets we have tested so far. Despite the lower price, the C6-01 isn't any worse than the N8 multimedia flagship, or the Cseries leader - the Nokia C7. When attached to an active external amplifier (i.e. your car stereo or your home audio system), the Nokia C6-01 performs greatly with no weak points whatsoever. All readings achieved in that part of our test were simply excellent and directly comparable to the best on the market. 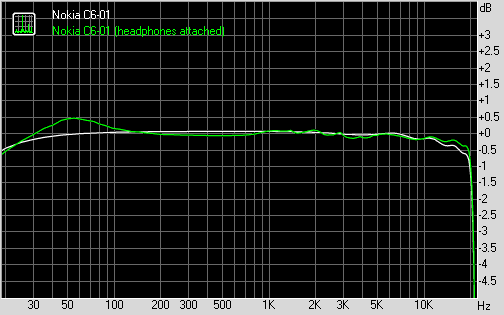 There wasn't much quality deterioration when we plugged in the headphones either. Sure, the stereo crosstalk got a bit worse (but still remained lower than on any of the previous two Symbian^3 handsets) and we recorded some intermodulation distortion, but for all purposes practical the output should be considered perfect. When it comes to video playback on Symbian smartphones, the Nokia C6-01 is still among the lucky few to have DivX and XviD support out of the box. And it doesn’t stop there. The playback was silky smooth on all files with a resolution up to and including 720p, which is quite impressive. The media player app itself only works in fullscreen landscape mode but, since anything else would have made the widescreen display useless, this is understandable. In fullscreen mode, a tap on the screen shows the controls, which are otherwise hidden. The amply sized high-contrast screen is also more than welcome for truly enjoying your videos. Some restrictions do apply though. For one the handset cannot play any file that is larger than 2GB and you cannot fast forward and rewind ones larger than 1.5GB. If you manage to keep your files below that limit (which basically excludes full-length 720p HD movies) you will be fine. The other problem with the video player is the lack of any kind of subtitle support. Generally, the Nokia C6-01 does extremely well on the video playback front but is certainly not perfect. Nokia should be able to address all those little shortcomings in some future software updates. And in the Web TV section you'll find a handful of apps giving you access to the latest news as well as to movie trailers or even whole episodes of various TV shows. The apps here include YouTube, CNN Video, National Geographic, and Paramount Pictures' Movie Teasers applications. Of course, each of them requires internet connection (over 3G/3.5G or Wi-Fi) and note that not all content is free. The FM radio on Nokia C6-01 has the same neat and simple interface as on its Symbian^1 predecessors. You can search skip preset and new stations alike with sweep gestures or you can use the virtual buttons. The C6-01 has RDS support and automatic scanning for an alternative frequency. This means that if you travel, the C6-01 should hopefully be able to auto-tune to your selected radio station. RDS info representation is the best part of C6-01 radio app. The radio station name gets displayed with cool effects across the whole screen, while the rest of the readings are printed in nicely legible font at the bottom.